You work with Maps by adding layers. The data for a layer can come from sources such as Elasticsearch documents, vector sources, tile map services, web map services, and more. You can symbolize the data in different ways. For example, you might show which airports have the longest flight delays by using circles from small to big. Or, you might show the amount of web log traffic by shading countries from light to dark. Before you start this tutorial, add the web logs sample data set. Each sample data set includes a map to go along with the data. 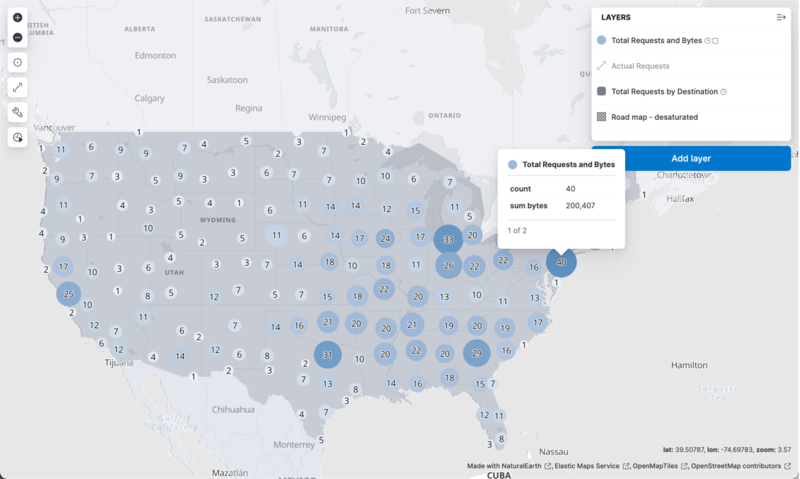 Once you’ve added the data, open Maps and explore the different layers of the [Logs] Total Requests and Bytes map. You’ll re-create this map in this tutorial.